The 21st century has been called the ‘Urban Century’. With rapid economic growth, many mega cities in the Global South have become global hubs of finance, production and consumption, attracting the rich and the emerging middle classes. At the same time informal economic activities as well as informal housing areas continuously expand. Under such circumstances cities are experiencing ‘compressed changes’ of economy and society resulting in multi-layered stratification. As a result, municipal governments as well as urban dwellers face multiple challenges they have to deal with on an everyday basis. Despite the empirical and policy relevance of this topic, urban studies in Asia are still weak compared to rural studies. In Europe and Northern America, urban studies have been actively developed with the result that so far most of the urban theories available are based on research in Western cities, thence establishing a bias towards these cities (McFarlane 2010; Robinson 2006). Metropolises like New York or Paris are considered icons and manifestations of modernity (King 2004). In contrast, mega-cities in the Global South are most often approached and conceptualized via development theory (Parnell and Robinson 2012; Patel 2014). Currently, we face the challenge that many developments in cities of the Global South cannot be explained simply by adopting Western urban theories. For example, the emerging middle classes in the cities of Global South display a strong performance as political actors and consumers. In the history of 19/20th century Europe, urbanization and the expansion of the middle class or ‘citoyen’ lead to the development of democracy and the formation of consciences for social welfare regimes and redistributive schemes. However, the new emerging middle classes in Asia and other parts of the Global South do not necessarily support democratic development and social redistribution, but on the contrary frequently accelerate conflicts with the urban lower classes over scarce resources in the city (e.g. land, water, food etc.). The workshop is a follow up of the Japanese German Frontiers of Science Symposium’s Social Sciences Panel on Mega Cities held in Kyoto in 2015. 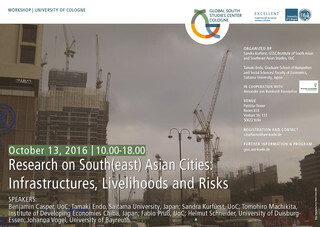 The aim of the workshop is to connect German and Japanese scholars working on Southern, in particular Asian, cities.